CANADIAN DEFENCE MATTERS: DEFENCE POLICY REVIEW, QUESTION FOUR: What form should the CAF contribution to peace support operations take? Is there a role for the CAF in helping to prevent conflict before it occurs? DEFENCE POLICY REVIEW, QUESTION FOUR: What form should the CAF contribution to peace support operations take? Is there a role for the CAF in helping to prevent conflict before it occurs? The Department of National Defence has announced that it is launching public consultations in the development of a new defence policy for Canada. This includes a Defence Policy Review public consultation paper, a website and even an e-workbook to be filled in. 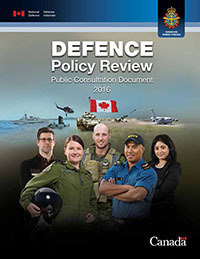 Canadian Defence Matters is attempting to come up with some answers to the ten questions contained in the public consultation paper. The fourth question asked in the public consultation paper is: What form should the CAF contribution to peace support operations take? Is there a role for the CAF in helping to prevent conflict before it occurs? According to NATO the term “Peace Support Operations” is now widely used by many civilian agencies to describe their activities in complex humanitarian emergencies. PSOs, as they are called, are multi-functional operations, conducted impartially, normally in support of an internationally recognized organisation such as the UN. They involve military forces and diplomatic and humanitarian agencies. PSO are designed to achieve a long-term political settlement or other specified conditions. It should be noted that Peace Support Operations include Peacekeeping and Peace Enforcement as well as conflict prevention, peacemaking, peace building and humanitarian relief. What distinguishes PSO from other military operations is the impartial approach by the Peace Support Force (PSF). At least in theory PSO are neither in support of, nor against a particular party, but rather are conducted in an impartial and even-handed manner. PSO, again at least in theory, are designed to create a secure environment in which civilian agencies can rebuild the infrastructure necessary to create a self-sustaining peace. As can be seen from the foregoing definition, Peace Support Operations are both complex operations and, of necessity, long term operations. It also becomes clear that military operations are only one part of a multifaceted campaign that involves both government and non-government organizations. All of which suggests that the government should approach the prospect of Peace Support Operations with caution and with the assurance of public support. Contrary to the much loved image of the Canadian soldier patrolling a notional ‘green line’, in reality the traditional role of the Canadian Armed Forces has been to provide technical and logistic support to peace keeping operations. There is no reason to suppose that this has changed. In the publication, UN Peacekeeping Challenge: The Importance of the Integrated Approach, the point was made that the United Nations already has enough infantry pledged from 'Troop-Contributing Countries'. What is needed, the authors point out, is technical assistance from those countries capable of providing it. Specialist Land Forces such as military police, disaster assistance relief teams, and even Special Forces. If Canada and Canadians are willing to embrace the complexities and the time lines that Peace Support Operations call for, then the Canadian Armed Forces can and should train and equip themselves to aid other government, and non-government, agencies in these kinds of campaigns.